The drum and bass duo of Cameron Edwards and Joe Lenzie teamed up with the 'Back For Good' hitmakers - Gary Barlow, Mark Owen and Howard Donald - to wow the crowds with a performance of their brand new track 'Cry'. Welcoming Take That onto the stage, they said: "You know this one right? You know we've got to do things big? 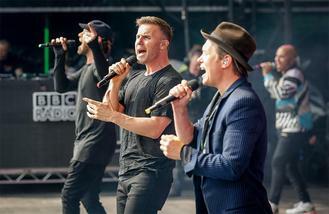 Make some noise for Gary Barlow, Howard Donald and Mark Owen." During their electric set, Sigma was also joined by their special guest Paloma Faith for their hit track 'Changes'. Earlier on in the day, Nick Jonas opened the main stage by performing a selection of his biggest hits including 'Levels', 'Close' and 'Jealous'. Other highlights included Meghan Trainor, who brought a touch of glamour to Devon, strutting up and down the stage in a black glitter gown. The 22-year-old pop beauty stormed through her biggest hits from 'All About That Bass', 'Like I'm Gonna Lose You' to her latest single 'No'. Next up on the main stage was Jake Bugg, who debuted his new song 'Bittersalt', which was inspired by an on/off relationship. Speaking exclusively to BANG Showbiz at Big Weekend, he said of the song: "Bittersalt is about an on and off relationship and I feel a lot of people have that experience of kind of feeling like when you are with a person you don't want to be with them but when you aren't with them, you do want to be with them." Meanwhile, Jess Glynne had spent the last 10 days preparing for Saturday's performance as well as her set at Glastonbury Festival. The flame-haired beauty wowed with a brand new set list but didn't miss out her biggest hits including 'Right Here', 'Rather Be' and fan favourite 'Hold My Hand'. Bastille debuted new songs too including a track called 'The Current' and confirmed they are busy working on their next LP. Introducing the songs, frontman Dan Smith said: "We've been away working on our second album. So we thought we'd play you a couple of new songs." And Bring Me The Horizon's singer Oli Sykes did an entire set without swearing, drawing in one of the biggest crowds into the In New Music We Trust tent. Finally, Mumford and Sons closed the evening and performed to the biggest crowd of the night. BBC Radio 1's Big Weekend Exeter 2016 will be live on Radio 1 on May 28 and 29. Watch live online, on BBC iPlayer, with highlights on BBC Four and Radio 1's YouTube channel.